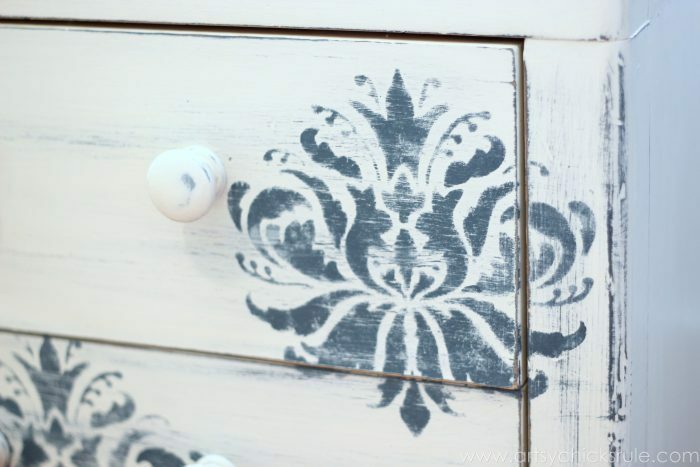 There’s not much a little Chalk Paint (and maybe a stencil or two) can cure! 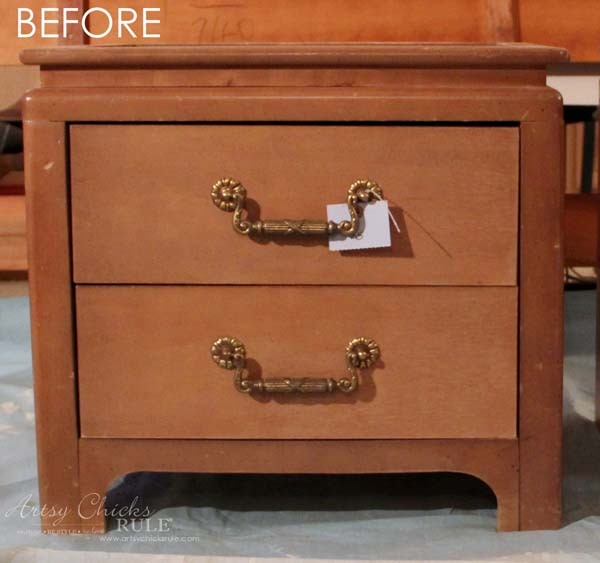 This thrifty night stand makeover is evidence of that! It’s themed Thursday! 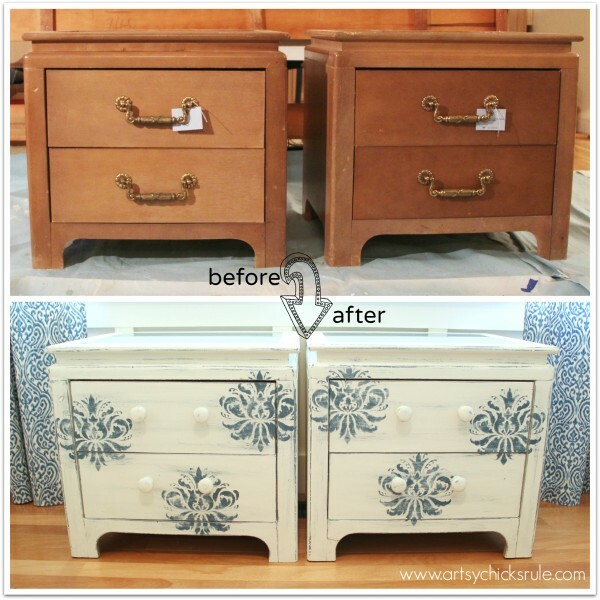 Every month, a few of my blogger friends and I get together to bring you a “themed” furniture makeover. 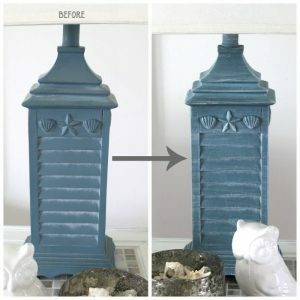 Last month it was “bold” and I shared this repurposed makeover. 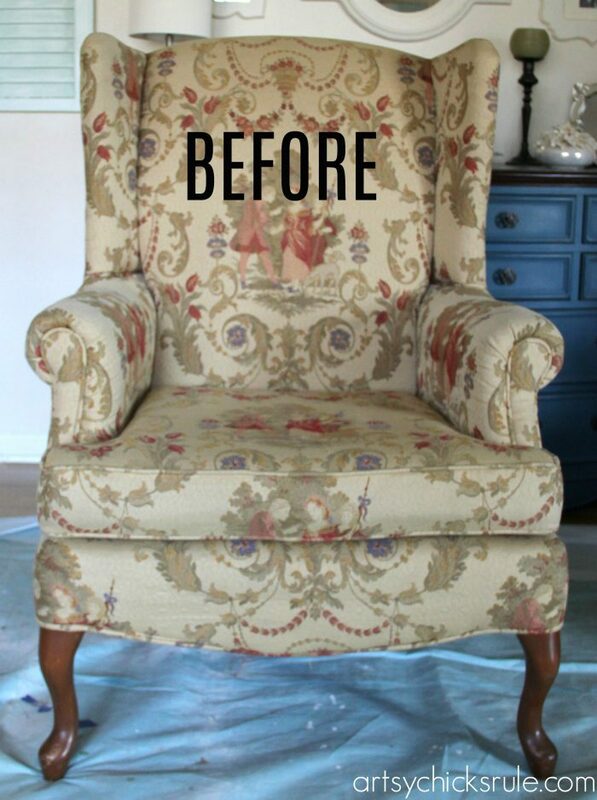 The month before was “metallic”…and I did this Turquoise & Gold Metallic makeover. This month is “FLORAL”or “FLOWERS”. Who doesn’t love flowers? I LOVE them. I just planted a bunch in my yard this past weekend. 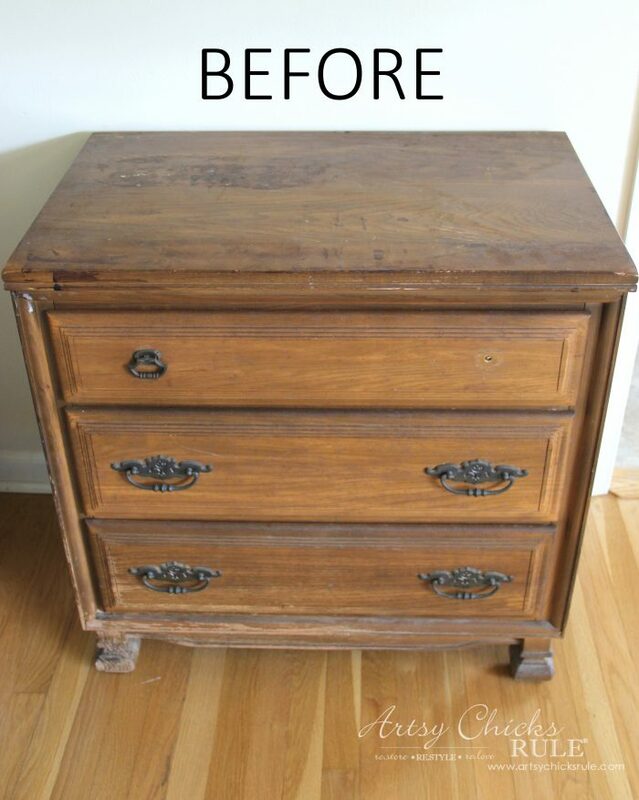 I had a few things in mind for this project but finally pinned it down to this—>a thrifty night stand makeover. 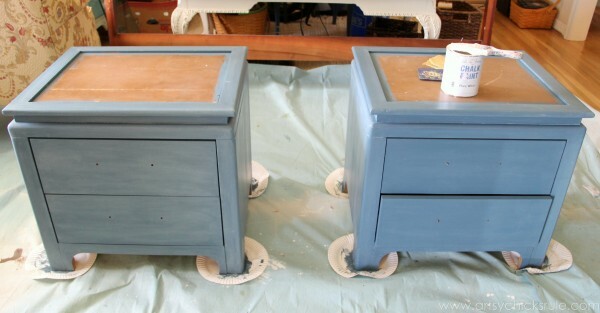 They were pretty beat up and the wood was kind of a weird color that didn’t really match. 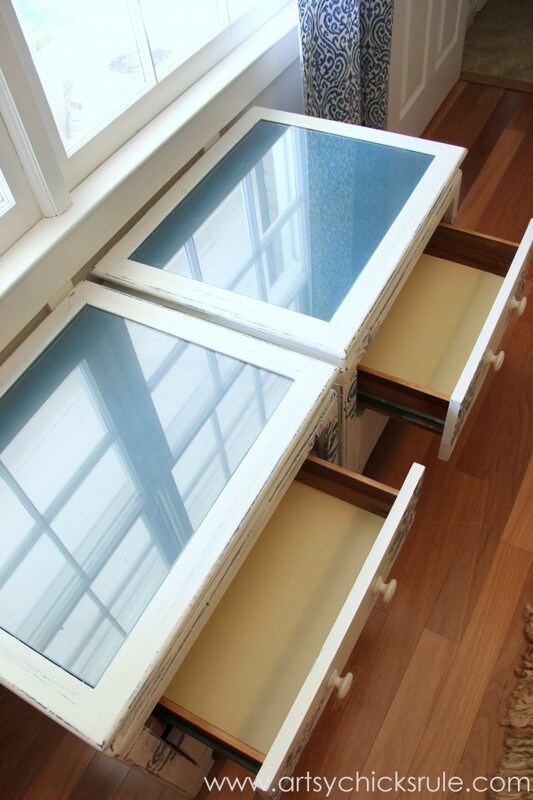 There are glass inserts that go in the top. 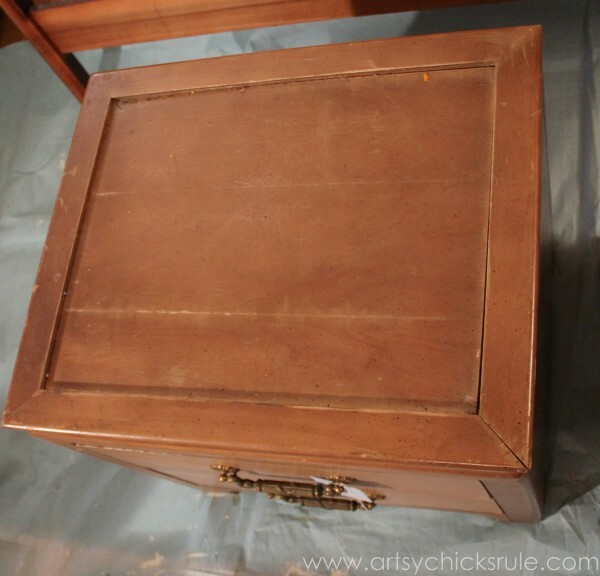 I originally wanted (well, I originally wanted several things that didn’t pan out) patterned fabric or paper of some sort under the glass on the top. Unfortunately I never found anything I liked to put there. 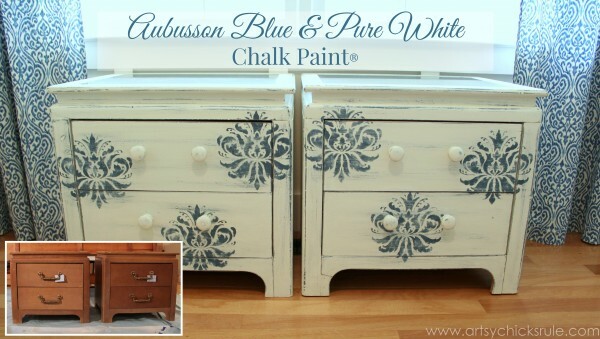 And I also originally wanted them to be Aubusson Blue as you can see here…. 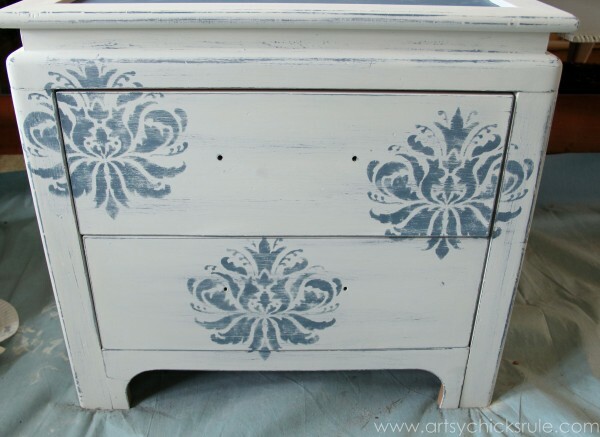 But that didn’t quite turn out how I wanted….so I painted them Pure White. So instead of having them BLUE…they’d be white with lots of blue showing through underneath. 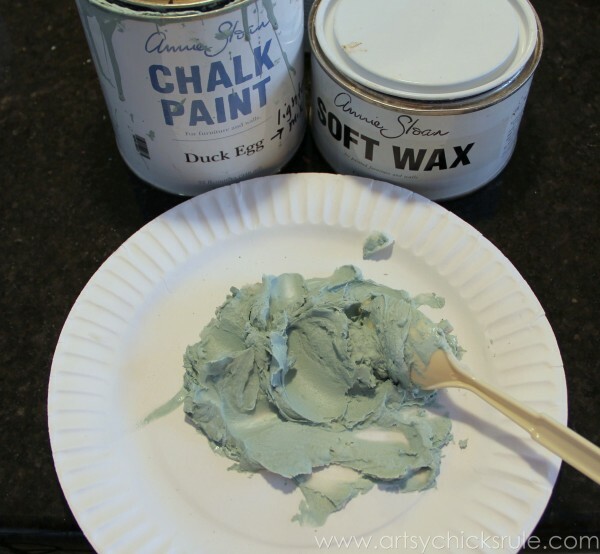 I sanded to pull a bunch of that blue through all over…. I placed them randomly around the front. I didn’t want them matchy-matchy. 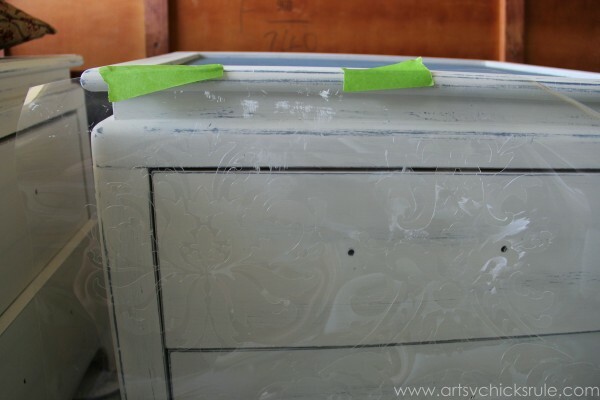 And then lightly sanded them…. 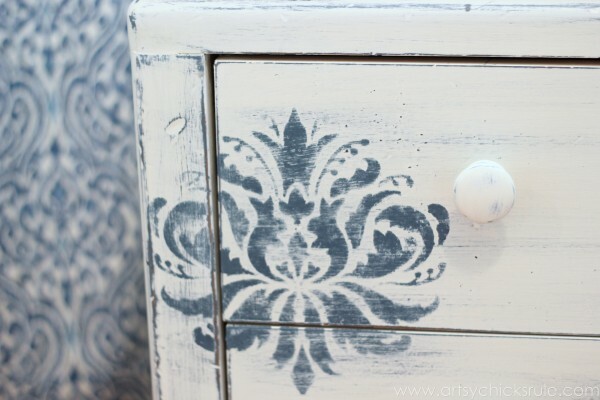 I painted and used the knobs that were originally on my china cabinet in my Dining Room. I wanted them to seamlessly blend in. I’m not sure I love them but they are better than what was on there for this design. The way I arranged the stencils the original handles would have covered up much of the bottom one. 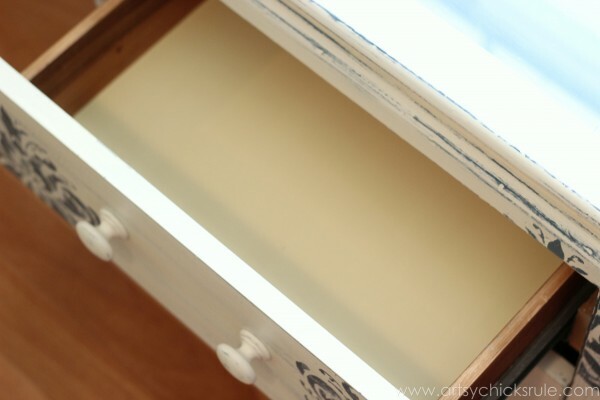 I didn’t give these drawers much “drawer flair” but I did give them a little something…. 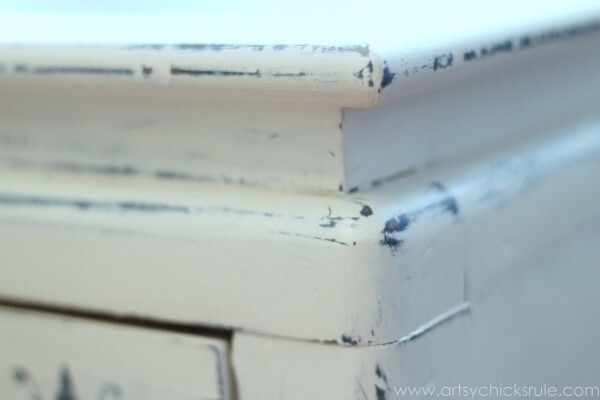 Cream Chalk Paint (which is actually a pale yellow). 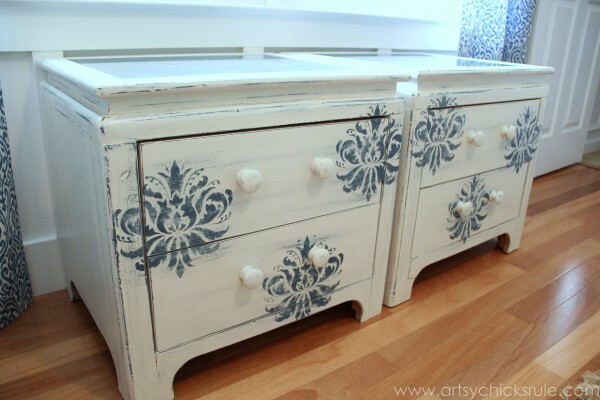 You can see the Aubusson Blue tops in this one…and the creamy yellow drawers. ….and now on to my friend’s pretties below! UPDATE!! You can see it now, here!! Be sure to click on each photo below to see them all!! Hope you all have a wonderful holiday weekend!! Evolve is one word!! lol State of continuing evolution is another! ;) They may still be in that evolving state!! aahhh, I love them Nancy. We do tend to change things a lot don’t we. I like the blue showing under the white. I’m really feeling the white paint lately. Must be from the dark Winter we had. Really like the tables! Thank you Kathy!! As much as I love color, I am really leaning more and more towards whites with hints of color instead lately myself!! 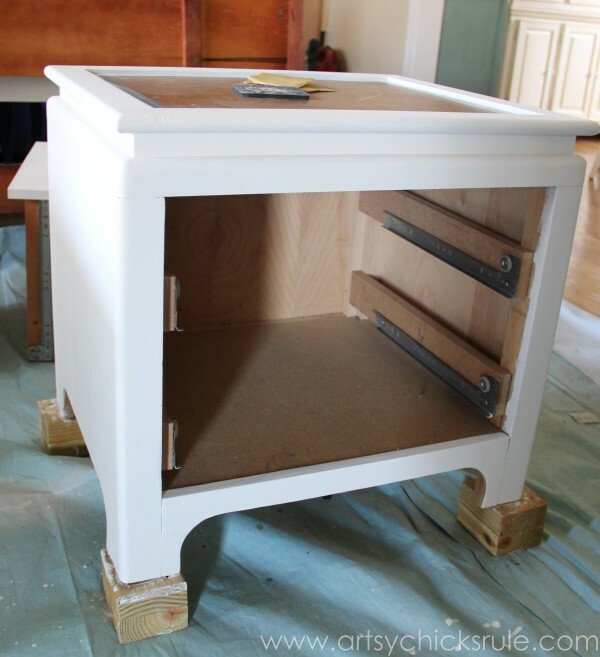 I re-do furniture the same way you do…start with one idea and it evolves as I see things happening. 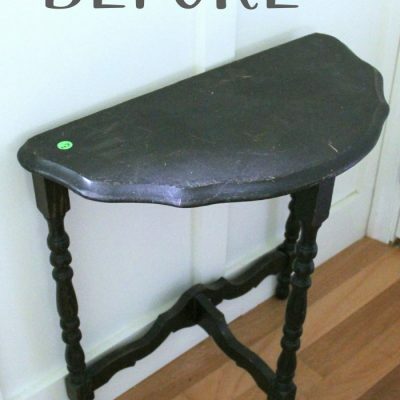 I love the stencil you chose — what a great transformation!! 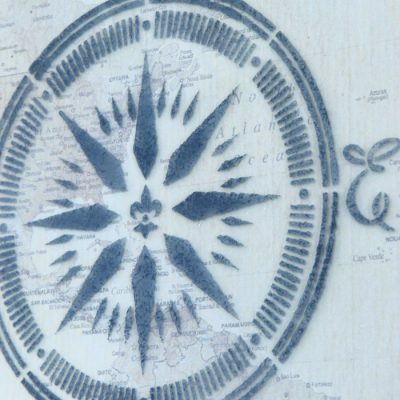 I love them…and the stencil. Where do you find treasures like that for $15.? 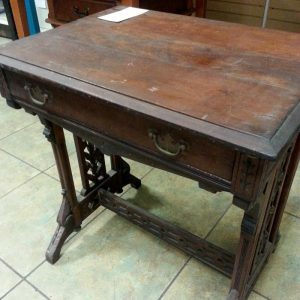 Our thrift stores and antique shops are way overpriced. They know there are crafters out there who are willing to pay big dollars. I’m in Houston and the market is terrible. I’ve given up even looking for pieces. Goodwill is a total laugh. They want $300-500 for a horrible looking small round table with chairs. The table wasn’t even real wood. I’m glad someone is still able to find bargains. Yours are great! This matching set is so cute! 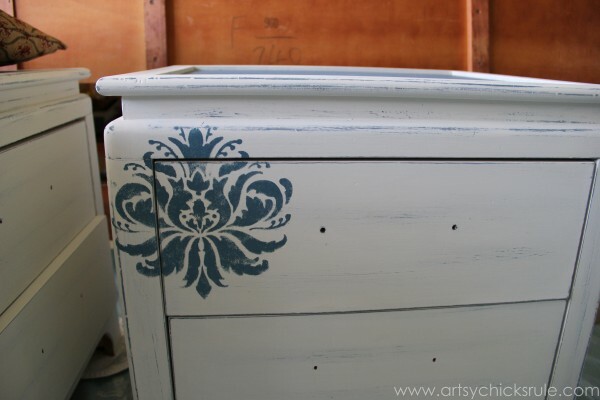 I love the color that you ended up with and the stencil adds the perfect touch. I think I need to visit this summer for some thrift shopping! Yes, you and I and Christy (Confessions of a Serial DIYer) can get together…would be fun! ;) There are a ton of thrift stores around here between this side of the water and hers! Beautiful job, Nancy! You always inspire me with your talent. 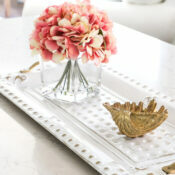 Love the glass, and the floral look. Thanks for sharing today. Soooo pretty! 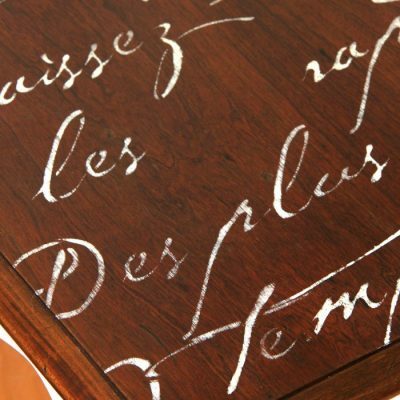 The nightstands have an awesome shape and details- and I’ve been dying to find something with a glass top too! Too bad you couldn’t find paper or fabric you liked to go underneath. 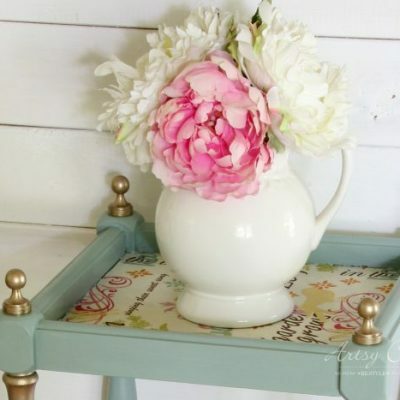 I have recently fallen in love with Aubusson, now I want to paint something else with it! Nancy, I loved how these turned out. The colors are beautiful. Good job – they look great. Those are awesome! I love them. Excellent finish! I love that you allow your imagination to show through in your pieces. Truly lovely! 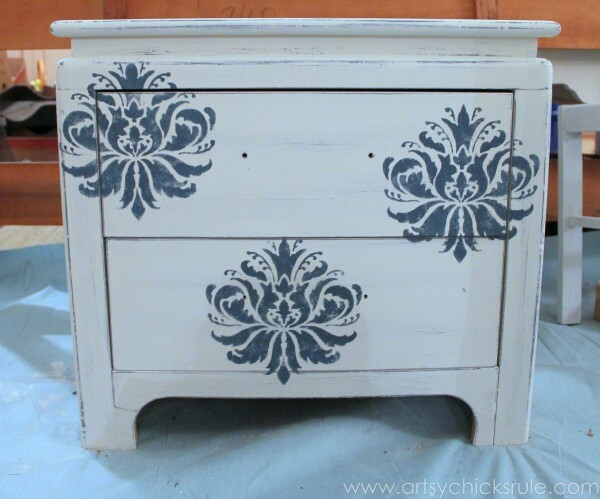 Would you be able to tell me if the stencil you used is available online? I love how you got in the zone and just let the project happen. Don’t you just think our best laid plans are great but its the layering and going with it that make for the really special redos?! And I’m all with you on no matchy matchy for the stenciling. I love how you placed them so random. Very pretty Nancy! You did good. Real good! Beautiful!! Awesome job!! Love them! !